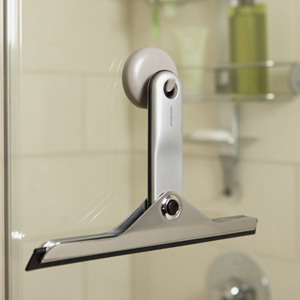 Squeegee's in the bathroom are used for wiping down the glass to remove any water droplets and are designed to leave the glass streak free after use. Simplehuman produce the best ergonomic Squeegees around and in their range they have a folding one and a rigid stainless steel one. Made from durable materials that won't tarnish or rust, perfect for the bathroom environment. So, you have a fabulous bathroom and you want a suitably stylish Squeegee ? Its simplehuman time.